Auxiliis is an international CRO (contract research organisation) company dedicated exclusively to paediatric clinical trials. With a clear ambition to set foot in USA and expand their market share in Europe, the management team realised that they were missing a solid corporate presence online. Supporting the business development and the expansion of the Auxiliis as a company – moving from one office to three locations worldwide – the website redesign was a major step in conveying a trustworthiness and company’s expertise. 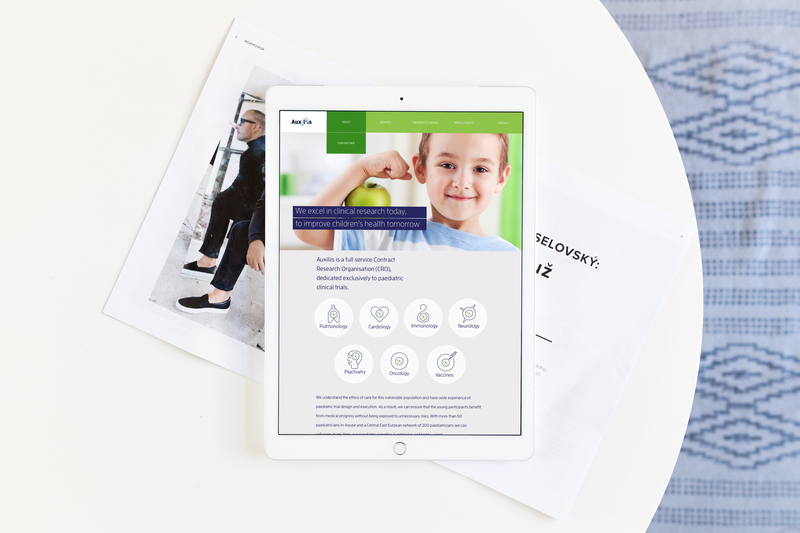 The goal for this project was to create a professional, representing website for Auxillis as a company and a complete overview of its services. To cover the various therapeutic areas of expertise that the company offers I developed an exclusive set of icons. In this project the iconography places a major role – it communicates the divers thematic expertise of the company. In addition to the website redesign, a various communication materials were developed later on. To mention a few: I have designed a new set of business cards, presentation slides, promo banners for events and promotional booth for conference exposure. In all the communication items I incorporated the a consistent look and feel which is the key to successfully brand your business. The newly created identity and digital environment was successfully launched and rolled out in all Auxiliis offices (in Europe and USA). Apart from conveying trust among the company clients and governmental authorities, the new designs brought a positive image in the hospitals and clinincal centres of Auxiliis. And by that a step closer in the journey of improving our children's health.